Under the Martial Empire, defiance is met with death. Those who do not vow their blood and bodies to the Emperor risks he execution of their loved ones and the destruction of all they hold dear. It is in this brutal world, inspired by ancient Rome, that Lai lives with her grandparents and older brother. The family ekes out an existence in the Empire's impoverished backstreets. They do not challenge the Empire. They've seen what happens to those who do. There, Laia meets Elias, the school's finest soldier - and secret, its most unwilling. Elias wants only to be free of the tyranny he's being trained to enforce. He and Laia will soon realize that their destinies are intertwined - and that their choices will change the fate of the Empire itself. "Laia is a slave. Elias is a soldier. Neither is free" just about sums up this particular story. Very reminiscent of Ancient Rome, the Scholars are a conquered people enslaved the warrior culture of the Martial Empire. Lana's mother and father had led the rebellion before being killed, but she fears she lacks their courage and poise. Elias was raised to be a killing machine, but he fears that he can not become the leader his grandfather hopes despite his overwhelming skill with a blade. Both characters are searching to find their true selves and unexpectedly form a bond that changes everything. This felt like a really long book. "Felt" because in all reality it wasn't too bad. I chose to tackle the title in the audiobook format because of an accented reader, but twelve discs is a little more than I usually listen to. The author switches perspectives each chapter between the two protagonists, but unlike many stories that follow a similar structure, she has created almost two very separate stories she's telling at the same time. 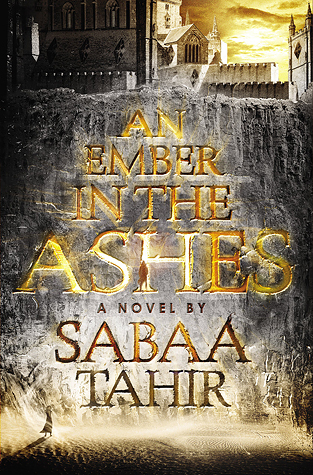 Yes, they do intersect and work together in a bigger picture, but the Elias chapters are very much his story, struggling with the mask that forces him to be warrior, and Laia's story, a young girl trying to live up to her family's reputation in the rebellion to save her brother. The story is extremely well-written and (despite being twelve whole discs!) flows smoothly and quickly even bouncing between two characters. There were a few instances when conversations and inner dialogue seemed to be repeated, but the character development was enough to create two people you came to care for and worry about. This will definitely be a book I recommend to my teens. It's a bit sophisticated (a lot of moving parts) so I wouldn't really recommend to my newbies in the Teen Room, but it's a perfect selection for readers who enjoy just a touch of fantasy and a lot of political intrigue.